To comment on the same picture as F15, the vodafone advert seems too wide in the glove. In the real picture it appears much more square, possibly with another sponsor next to it, i can’t tell – it’s either another sponsor or a white box with red in the middle. If it’s a shell logo, it appears awfully red – compared to the usual Yellow icon with red lines. Its defiantly a shell logo’ thanks for spotting that, reason why I posted the template and also the reason why its very stretched it because on the model its stretches it out to its proper size. 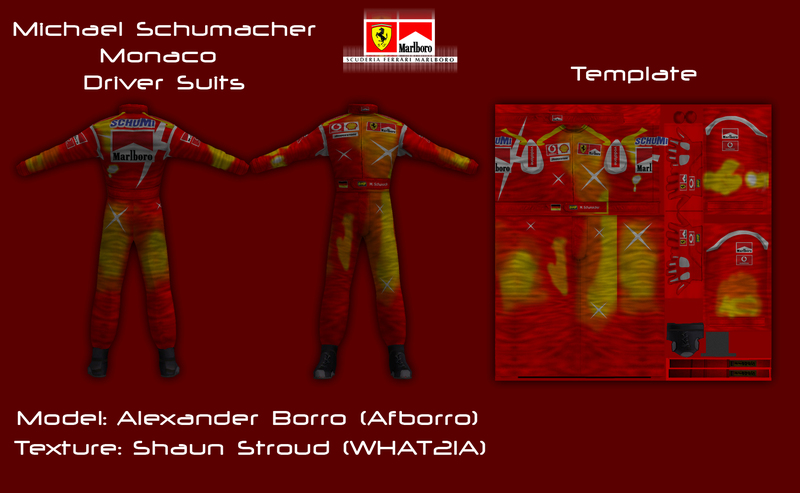 I wonder why the complete suit of every driver is modelled. How do you actually ‘convert’ a mod from game to game? I would have thought that converting CTDP 2005 from rFactor to F1 Challenge would have meant a complete revamp of the files you had, yet it doesn’t seem that way. Well my definition of a conversion is, that you take a finished mod from one game and you convert those files to a second game without having the actual sources. We have our source material, our models, our textures and they are independent for any game. The shapes got some slight overhaul, new shaders of course, but in theory they are identical for both games.